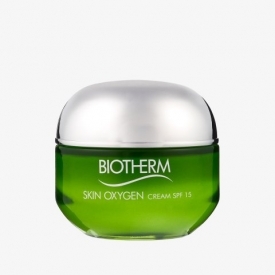 Biotherm Skin Oxygen Cream SPF 15 is a very light day cream that is specially developed for a normal or oily skin. Cream is enriched with Chlorella algae extracts, known for its detoxifying properties, as well as antioxidants, which protect the skin from contamination and UV rays. This cream strengthens the skin and helps keep the skin fresh, moist and even. As it is factor 15 in the cream, it will provide a nice protection against both UVA and UVB rays and the skin will be left with a renewed glow. 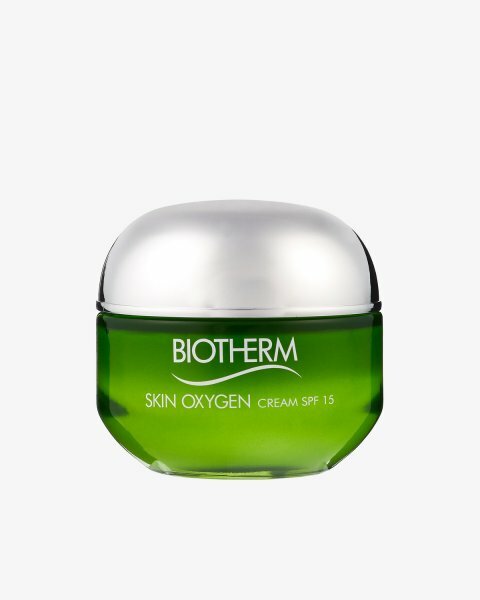 Despite the producer claims that Biotherm Skin Oxygen Cream SPF 15 is a light textured product, I've found it quite dense. The cream has a bit green-ish tint and sharp scent. It absorbs in several minutes but leaves the feeling of a film upon the skin, a slight sheen as well as a lingering scent that for me is on the brink of unpleasant. The outcome of using the cream is good in the short-term - the skin is moisturized and protected, however, taking into account the ingredients, I would advise against using the cream often.